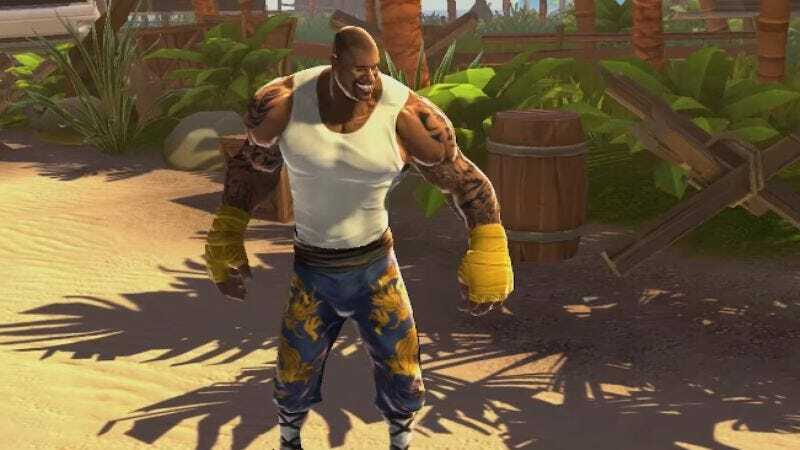 A year later, the crowdfunding campaign for the new game—titled Shaq Fu: A Legend Reborn—appeared to have already fulfilled its primary function, in that we all got a chuckle at the idea of a Shaq Fu sequel, and then we moved on with our lives. But apparently neophyte studio Big Deez Productions didn’t get the memo, because they’ve been hard at work translating O’Neal’s famous combat acumen into an actual game, which they showed off at last night’s The Game Awards ceremony in L.A. Most of the teaser trailer devotes itself to the game’s knowingly stupid-looking story, but there’s also some actual gameplay on display. (It involves kicking people.) There’s no sign of Auruch, Kaori, Colonel, or any of the other beloved fighters from the Shaq Fu-niverse (or Aaron Carter, who seems like he’d be a natural fit), but we do get a look at some truly terrible new character designs, including a guy we’re going to call “Fat Nazi,” and some sort of supervillain with a giant tank of purple “Sizzurp” strapped to his back.